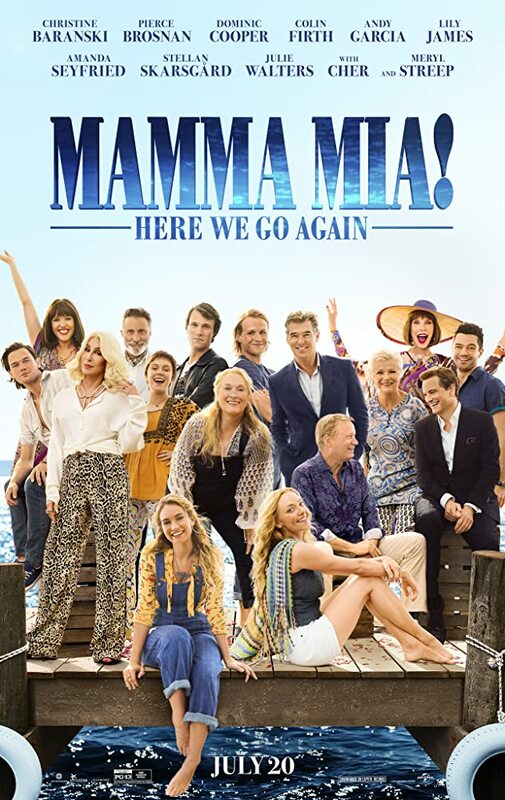 The first Mama Mia movie was fun. I found this one maudlin, though the songs were well done. It got me in the feels, several times, as, indeed, it was trying to do, but so OTT that I disliked my emotions being manipulated. The performances were good, the set pieces excellent. Pity that the character of 'Fernando' was dropped in with all the subtlety of a clog in order to get the one song in. So what did I like about it? Well, as usual, the three dads, Pierce Brosnan, Stellan Skarsgard and Colin Firth, played it perfectly and Julie Walters and Christine Baranski reprised their characters beautifully, but if you were expecting another tour de force from Meryl Streep, forget it, except in flashback and a cameo at the end. This was mainly the younger actors taking over. Sophie (Amanda Seyfried) wants to know how her three dads met her mum, so cue the younger versions of Donna (Lily James), Harry (Hugh Skinner), Sam (Jeremy Irvine), and Bill (Josh Dylan) with young Rosie (Alexa Davies) and Young Tanya (Jessica Keenan Wynne). Kudos to Lily James and Amanda Seyfried (presuming they did their own singing). And, yes, I did spot Benny Andersson as the piano player in the cafe scene. It's set five years on from the last movie and things have changed in a big way. Sophie is reopening the hotel after renovations and has some good news to relay to husband, Sky (Dominic Cooper). Guests are gathering for the grand party, but Donna has left a big hole in everyone's lives. Enter Grandma (Cher!). And how about the songs? Well, it was obvious they couldn't have all the same ones again (though they did duplicate the obvious one) so there were some that I wasn't familiar with, only having a passing acquaintance with Abba. They all worked well, on screen, though. And if it handn'r been for the excessive tear-jerking I might have given this five stars. As it is, maybe three and a half. Worth watching, but I won't be rushing out to buy the DVD.